The other week I had a really bad day at work but my day was instantly made so much better after I found out I won our work lottery. I had £49 and no idea what to spend it on. I then got thinking of which product I have wanted to buy for a long time but haven't because of the price. 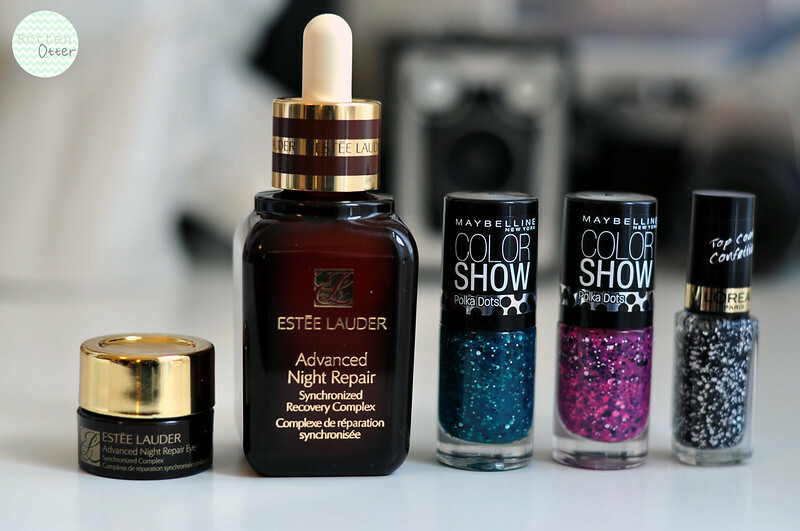 Estee Lauder's Advanced Night Repair instantly came into my head as I've tried a seven day sample in the past and really liked it. I've never spent more than £25 on a product though so to hand over £60 is a big jump. I also decided I wanted the 50ml as it works out cheaper overall and if I fall in love with it then it'll last longer. The lovely lady at the counter also popped a little tub of the Advanced Night Repair for Eyes into my bag which I was made up about. I've also wanted to try it for a long time and had asked for a sample of it expecting a sachet or two. Instead I got a 5ml tub which works out to about £12! On the same shopping trip I picked up a couple of nail polishes from Superdrug as it was 3 for 2. Finally I found the L'Oreal Confetti top coat which has been sold out in every single shop I've looked in. I also picked up two of the new Maybelline Colour Show Polka Dots polishes which I hadn't heard about. I love the serum but really don't rate the eye cream! !